Discussion in 'Outdoor Cooking and BBQs' started by CraigC, Dec 16, 2017. 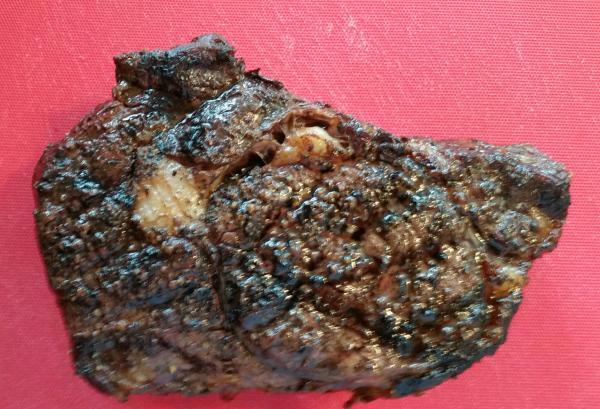 The technique of reverse sear creates some beautiful results. You start with a low fire to bring the internal temperature to within 10F of your desired finished temperature, remove the steak, letting it rest while you crank the temperature to 650F. Then you sear the steak to get that great crust. The steak is seasoned with just salt and pepper. After using this method on a 3" thick rib-eye, Karen said I'M not allowed to cook rib-eyes any other way. 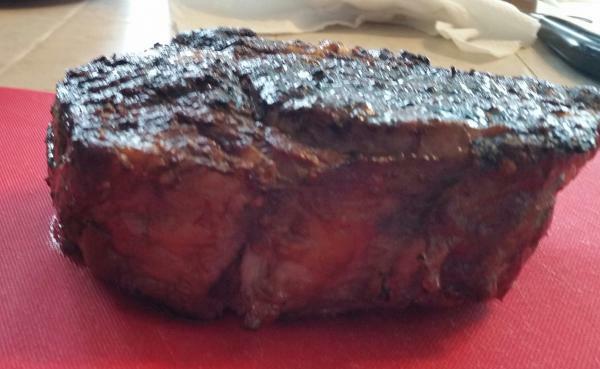 I had to have the butcher cut this steak as the ones in the case don't come close to 3" thick. After the searing which only took 1 minute per side, being rotated 90 Degrees after 30 seconds. 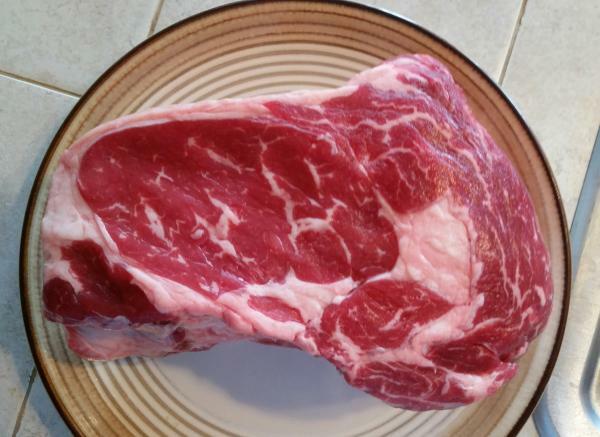 We get thick steaks from Sam's Club and slice them in half ourselves lengthwise. We then eat these portions one day and the other portions another day. CraigC and ElizabethB like this. The meat department at my local market cuts rib eye to order. I have never considered a 3" steak. 1" to 1 1/" is enough for us to have 2 meals. 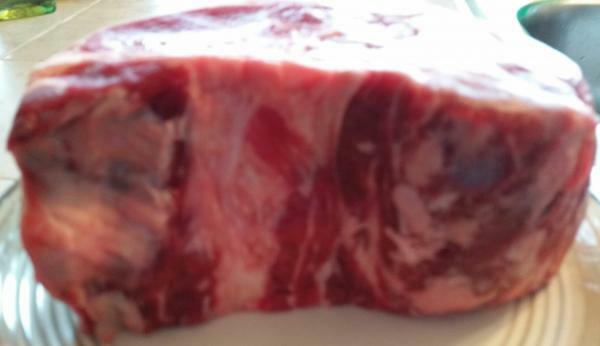 We get whole rib eye at Costco - Black Angus - and cut them ourselves. The next time we get one I will cut a 3" steak and try your method. We do not have a BGE. The broil temp on the oven is 500 degrees F. Would it work if I did the initial cook in the oven then crank it up to broil? 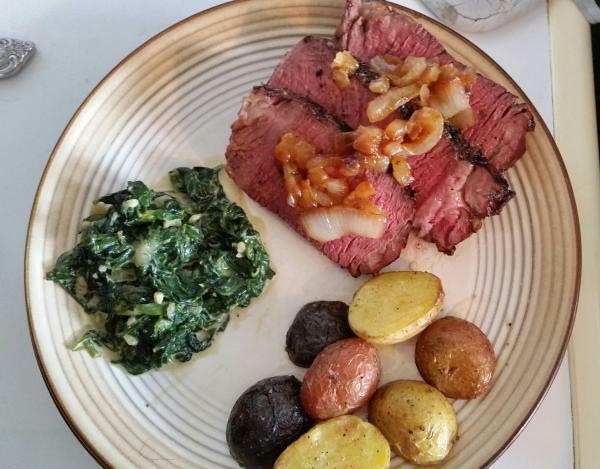 The technique of reverse sear creates some beautiful results. That is certainly a beautiful result. 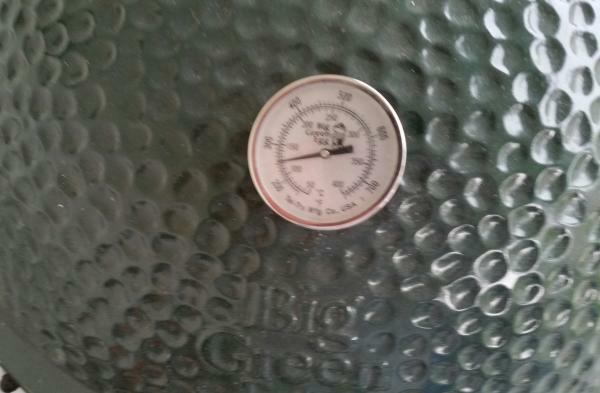 I'm getting jealous of that BGE! Do you have a propane jet cooker for doing crawfish boils (Bayou Classic)? if so, you could do the low and slow in the oven and get a cast iron pan white hot (as you would for blackening) and do the sear in it. If you're into sous vide, you could bring the meat up to the 10F below desired internal temperature and then sear it in the CI pan. We like the taste that the hardwood charcoal provides using the BGE. You can't get the 1800F that Ruth's Chris does with their ovens/broilers, but I think the wood taste off sets that unique technique. Of course we have a propane burner for boils. G has an LPG grill with a side burner. I frequently sear steaks in a cast iron skillet on that burner. That would work. I'm not sure that side burner can get to the temperatures that the propane burner can. Many folks try doing stir-fry on their gas stoves (about as good as that side burner on the gas grill) but they can't develop the BTUs to achieve "Wok Hei". that is why I have been using the propane burner for stir-fry. 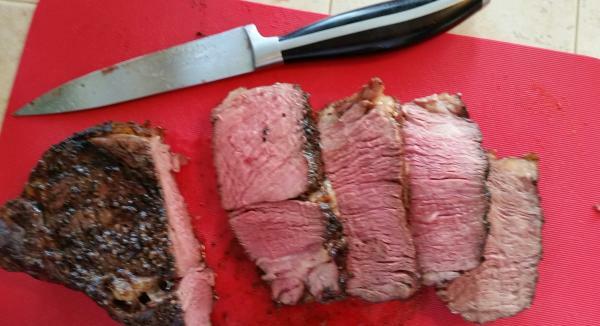 That's not a steak - it's a Sunday roast! Looks amazing. Generally in the UK we lack both the equipment and the skills for outdoor cooking, probably due to the climate. I do reverse sear occasionally using a cast iron skillet on a gas hob, but not for steak. I don't think I've ever cooked a steak more than 1" thick (a piece of fillet would be a little thicker) so two stage cooking not needed. ElizabethB, morning glory and CraigC like this. Funnily enough, I've nearly always cooked steak in the oven with veggies etc and then give the steak a quick zap in a heavy bottomed frying pan to get the colour. Same works nicely for chops too. I love reverse seared rib-eyes. My buddy picks will pick us up a 28 day aged Bone in Tomahawk Rib-eye. 32 ounces, 2 ish inches thing. We only season it with kosher salt I believe. Then he uses the reverse sear method. I'll have to look for some pictures. They are somewhere on photobucket I believe.